The annual State of the Union address is a chance for the president to deliver his vision and policy priorities -- and sometimes exaggerate or outright misstate his accomplishments and the reasons for taking policy actions. Here's a look at what President Trump got right and what he got wrong Tuesday night. What Trump said: "In just over two years since the election, we have launched an unprecedented economic boom -- a boom that has rarely been seen before. There's been nothing like it." The facts: Economic growth accelerated last year as the Republican tax cuts took effect, putting the economy on track to top 3 per cent annual growth for the first time since 2005. The partial government shutdown delayed the fourth-quarter data to confirm that. The best year during the Obama administration was 2.9% in 2015. Experts said the US economy was better in the late 1960s and 1990s. But the initial stimulus from the tax cuts, which included slashing the corporate rate, began to fade in the second half of 2018. After expanding at a 4.2 per cent annual rate in the second quarter last year, growth slowed to 3.4 per cent in the third quarter and the consensus fourth-quarter forecast is about 2.6 per cent. The Federal Reserve is projecting 2.3 per cent growth this year and 2 per cent growth in 2020. Some economists are more pessimistic and said a recession could hit in 2020. What Trump said: "Unemployment has reached the lowest rate in half a century. African American, Hispanic American and Asian American unemployment have all reached their lowest levels ever recorded." The facts: The unemployment rate dropped to 3.7 per cent last fall, the lowest since 1969. It was the extension of a steady trend that began in 2009 after the rate surged to 10 per cent. The unemployment rate was up to 4 per cent in January, but that was for a good reason as more people joined the labor force. The unemployment rates for both blacks and Latinos last year hit all-time lows since the government began tracking that data in the early 1970s. That continued a downward trend that long predated Trump taking office. Both rates have climbed recently along with the broader rate and no longer are record lows. The unemployment rate for Asian Americans was 3.2 per cent in January. The record since that data began being kept in 2000 was 2 per cent in May 2018. What Trump said: "We have unleashed a revolution in American energy -- the United States is now the No. 1 producer of oil and natural gas in the world. And now, for the first time in 65 years, we are a net exporter of energy." The facts: The U.S. is the world's No. 1 producer of oil and natural gas. But the nation actually imports more energy than it exports -- and has done so since 1953. This could change soon but hasn't yet. According to a recent Energy Department forecast, the country is expected to be a net exporter of coal, oil and natural gas by 2020. What Trump said: "We have secured a $100-billion increase in defense spending from NATO allies." The facts: Trump is referring to the commitment by NATO members to spend at least 2 per cent of their gross domestic product on defense by 2024. The alliance set the 2 per cent spending target during the Obama administration. Trump has pressed the alliance to meet that commitment, and if all 28 other countries in NATO do, total defense spending within the alliance would rise by an estimated $114 billion, according to a 2018 Brookings Institution study. And although Trump claimed the spending increase is "secured," not all members are expected to reach the goal by 2024. What Trump said: "In the past, most of the people in this room voted for a wall -- but the proper wall never got built. I'll get it built." The facts: Customs and Border Protection spent about $2.3 billion between fiscal 2007 and 2015 to increase barriers on the border from 119 miles to 654 miles, according to the Government Accountability Office. Congress has appropriated nearly $1 billion in the last two years for about 50 miles of replacement fencing in California, New Mexico and Texas. Last year, lawmakers gave Trump more than $640 million for 25 miles of new levee fencing and other "to be determined" barriers. Trump's impasse with Congress over his demand for $5.7 billion to build about 230 more miles of walls along the border led him to force a partial shutdown of government that lasted 35 days, the longest in U.S. history. So far, no new miles of border barrier have been completed under Trump. What Trump said: "I want people to come into our country -- in the largest numbers ever -- but they have to come in legally." The facts: Apprehensions at the border, the most commonly used measure for illegal immigration, are at historic lows. In fiscal 2018, US officials apprehended just under 400,000 migrants at the border. From the 1980s to the mid-2000s, apprehensions routinely reached more than 1 million migrants a year. The administration also has taken unusual steps to limit legal immigration. It has targeted asylum seekers, refugees, permanent residents and green-card holders, as well as people with temporary protection from deportation who were brought to the U.S. as children or came after disasters or conflict in their home countries. What Trump said: "Tolerance for illegal immigration is not compassionate -- it is cruel. One in three women is sexually assaulted on the long journey north. Smugglers use migrant children as human pawns." The facts: A border security system designed for single, adult males has been overwhelmed by rising numbers of mostly Central American families and unaccompanied minors who are seeking asylum in the United States. In December, two migrant children died in U.S. custody, the first such deaths in more than a decade, authorities said. But academics and advocates say Trump administration policies may be putting these women, children and families at greater risk. In December, a federal judge deemed illegal an administration policy that sought to block victims of gang and domestic violence from claiming asylum in the U.S. A prior ruling barred the administration's attempts to eliminate asylum claims made by migrants crossing into the U.S. between ports of entry. The administration has begun forcing some asylum seekers to wait in Mexico while their cases are considered in the United States, a dramatic shift in long-standing US immigration policy. The implementation started with Tijuana -- though it suffers from high crime and violence. What Trump said: "The savage gang, MS-13, now operates in at least 20 different American states, and they almost all come through our southern border." The facts: The Trump administration has said MS-13 poses a more serious threat to the United States than any designated transnational criminal organization -- even Mexican cartels and terrorist groups. Independent studies show the group is relatively small in the United States. But there's little indication that Central American families and minors fleeing gang violence have increased MS-13's numbers north of the border. Only a fraction of unaccompanied minors apprehended since 2011 have confirmed gang ties. What Trump said: "If I had not been elected president of the United States, we would right now, in my opinion, be in a major war with North Korea with potentially millions of people killed." The facts: In 2017 and early 2018, Trump traded insults and threats with North Korean leader Kim Jong Un, with Trump warning of "fire and fury" and Kim calling Trump a "deranged dotard." Tensions rose dramatically until nimble diplomacy by South Korea's president helped arrange a way out. Trump and Kim met in June in Singapore and agreed to seek "full denuclearization of the Korean peninsula," although U.S. officials admit that has not begun. What Trump said: "Today we have liberated virtually all of that territory from the grip of these bloodthirsty killers." The facts: Top U.S. intelligence and military officials say Daesh remains a potent threat even though it has lost most of the territory it once controlled. Dan Coats, the director of national intelligence, told Congress last week that Daesh "is intent on resurging and still commands thousands of fighters in Iraq and Syria." What Trump said: "It is time to give our brave warriors in Syria a warm welcome home." The facts: Trump said in December that all 2,000 US troops were "coming back now" from Syria but the withdrawal has yet to begin. Pentagon officials now say it will take place over the next four months. The number of US troops in Syria may increase as support troops are brought in to help disassemble bases and equipment and move it out of the country. The Pentagon wants to maintain pressure on Islamic State even after U.S. ground troops leave, and appears to be settling on a strategy that will employ airstrikes and raids by special operations troops in neighboring Iraq. What Trump said: "I have ordered another 3,750 troops to our southern border to prepare for the tremendous onslaught." The facts: Trump first sent active duty troops to the border a week before the Nov. 6 midterm elections, raising concerns in the Pentagon and in Congress that he was using the military for partisan political purposes. About 2,300 troops are now posted near border crossings, down from about 5,900 in November, to help the Border Patrol. On Sunday, the Pentagon said it would send another 3,750 troops to help reinforce barriers and monitor crossings. That would bring the total to about 6,000, close to the original deployment. What Trump said: "Already, as a result of my administration's efforts, in 2018 drug prices experienced their single largest decline in 46 years." The facts: Federal data show that overall per-capita spending on prescription drugs declined in 2017, though not as much spending went down in several previous years, including 2010 and 2012. But projections suggest drug spending is once again increasing as prices continue to shoot upward. In January, pharmaceutical companies hiked prices on more than 250 prescription drugs, according to a Reuters analysis. Here's a look at what US President Donald Trump said during his State of Union speech. (All posts in UAE time). "But we must reject the politics of revenge, resistance, and retribution - and embrace the boundless potential of cooperation, compromise, and the common good. Together, we can break decades of political stalemate." US President Donald Trump said Tuesday that talks with Afghanistan's Taliban were making headway as he voiced cautious hope for a negotiated end to America's longest war. President Donald Trump vowed Tuesday to get his disputed border wall built despite Democratic opposition, even as he urged Congress to "work together" and forge a deal on border security. For more than five years, Victorina Morales made Donald Trump's bed, cleaned his toilet and dusted his trophies as a housekeeper at one of his golf clubs - without legal status to reside in the United States. 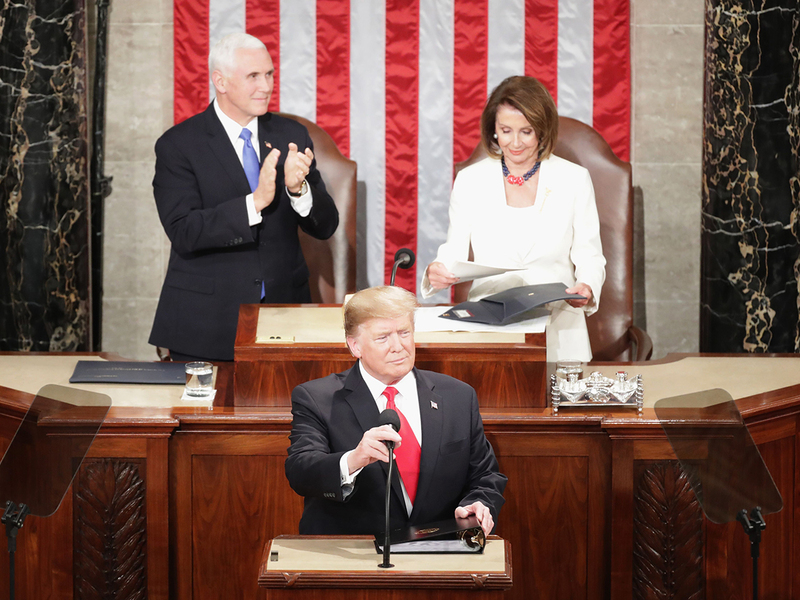 On Tuesday night, the 46-year-old from Guatemala took her place as a Democratic lawmaker's guest for the president's State of the Union address to Congress, where she hoped to be a powerful symbol of the undocumented migrants his administration has demonized. "If I could talk to him, I would tell him that we want immigration reform for us immigrants here, we are 12 million and we have come to work, to fight, we have not come to invade this country," she told AFP. "I speak not only for myself, I speak for all the others and I have faith, people will hear us," she continued, her voice breaking with emotion. Morales, who crossed into the US without papers in 1999, went public with her story in December, when she told The New York Times about her time as an employee at Trump National Golf Club in Bedminster, New Jersey. She quit to become a campaigner, while several other undocumented employees were fired. So why, after all those years, did she decide to speak out? "Because I've had enough of insults, aggression, humiliations - because it hurts to be told that you are an immigrant who knows nothing, that you can't complain, or else they'll call immigration services," she says. Trump's New Jersey golf course falls in Coleman's constituency, so the lawmaker decided to invite Morales as her guest to the president's speech, a key fixture in US politics in where American leaders tout their accomplishments and outline their future vision. "I believe that Ms Morales is the face of immigration and undocumented individuals in this country, hardworking, who want a better life for their families," she said, adding that Morales had fled violence to come to the US, seen as a land of opportunity. Coleman added that she wanted to highlight the "hypocrisy" of Trump, who as president has tirelessly fought to get funding for a border wall along Mexico to combat what he calls the crisis of illegal immigration. "But the businessman, the entrepreneur, Donald Trump had no problems hiring people who didn't have full documentation," Coleman said. Trump's golf course denied to US media having knowingly hiring undocumented migrants - but a Democratic lawmaker has called for an investigation into alleged labor violations. As a result of being a "material witness" to these violations - and the fact she now has an asylum claim - Coleman believes Morales should be safe from deportation - which would, she said, amount to "retaliation." He also spoke of his long-awaited second summit with North Korean leader Kim Jong Un on February 27 and 28 in Vietnam. "If I had not been elected president of the United States, we would right now, in my opinion, be in a major war with North Korea," Trump said in his annual State of the Union address to Congress. He also called on China to make the kind of far-reaching "structural" changes to industrial policy that analysts say Beijing is likely to resist. President Donald Trump took a swipe Tuesday at the ongoing probe of the president's possible connections to Russia, saying during his State of the Union address that "ridiculous partisan investigations" could slow down America's economic growth. "An economic miracle is taking place in the United States, and the only thing that can stop it are foolish wars, politics, or ridiculous partisan investigations," Trump said during his speech. "If there is going to be peace and legislation, there cannot be war and investigation. It just doesn't work that way," he added. President Donald Trump used his State of the Union address on Tuesday to call for a new era of cooperation to break "decades" of political gridlock and unlock America's promise.